Following our success with Eudemonic, Andres Roberts approached us to take on his newest venture in producing the web design for SHINE unConference. Shine unConference is a unConference for social entrepreneurs which took place between the 9th and 11th of May. With six hundred social entrepreneurs attending and a fantastically packed schedule it was an honour to do the site for this event. 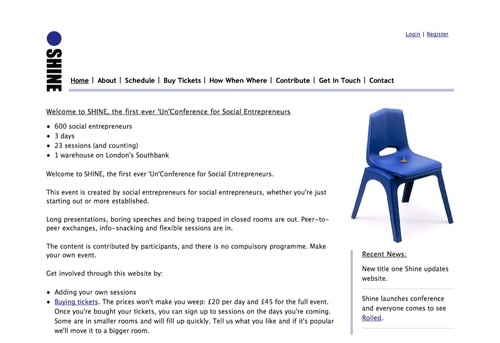 The idea of the SHINE unConerence was to help social entrepreneurs with a variety of topics that they face ranging from getting grants to blogging. These sessions were held by partners and anyone who came forward with a good idea for holding one, user’s would then register on-line and then attend sessions on the day. Being completely unrestricted to one session and allowed to drop in and out of anything they wanted to. We designed the website in a very short amount of time and put it all into the Expression Engine content management system using Event Brite for ticket management and building our own script to automatically register users that had bought tickets from the site. The end result was a completely automated system for Eudemonic to manage everything within and something we were very proud to hand over to them.